Blackjack aka Jack Young was a stuntman. He has done so many things including The Rifleman. What a great memory he has and he's sharing it with us. He has been sending me a lot of information for sometime. Once he finishes sending his information, I'll see if anyone has any questions. Jack will be 92 this September. 1)	This was my give-a-way picture when making personal appearances. 2)	About to be shot from the rooftop - This was from a street show at Frontier Village, Wichita, KS. 4)	As the infamous gunfighter, Jack Reece - He is a made up character that I used in street shows. 2)	Working with Ty Hardin who was Bronco Layne in the TV series BRONCO. 3)	Working with Clu Gulager who was Billy the Kid in the TV series THE TALL MAN. We are lower left. 4)	I worked in several episodes of DEATH VALLEY DAYS. We shot a couple one after the other. Here is the cast from the first. I’m 2nd from left. 5)	The cast from the next one…I’m 2nd from left again. 1)	I’m doing a roof fall. Notice there is no pad on the street. I was only one of a few that would do that. 2)	Another episode of DEATH VALLEY DAYS. I’m on the left but had to work this one without my mustache. 3)	Another roof fall but this one didn’t go as planned. I came off in an awkward position, my head hit the hitching rail and knocked me out for a short spell. Other than a giant headache, I was OK.
5)	Publicity pix. I’m 2nd from right. 1)	Here I’m between two other stuntmen. 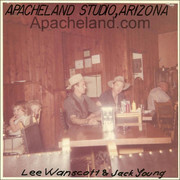 2)	Lunch break at Apacheland Movie Ranch. 3)	Relaxing after a tough day of stunts. 4)	I was MC for Lew King of the LEW KING RANGERS. He had a stable of young people that were singers, musicians, actors, dancers, etc. He let one kid go telling him he would never make it as a singer. That kid turned out to be Wayne Newton who has been singing in Vegas for 40 + years. His bad. 5)	Here I’m a Confederate Soldier. 6)	About to be shot from the tower. 2)	Working in an English commercial. Note the dog in the boot. 3)	Shot from the roof. 4)	Giving the bad guy a flying kick in a street show at Old Tucson. 5)	Between scenes of TWO RODE TOGETHER in Alamo Village, Brackettville, TX. The Producer got the drop on me with my own gun. Hahaha. 1)	Shooting an instructional tape for the golfer, Tom Kite. Left to right: Me, Tom, Julius (Dr.J.) Erving (pro basketball player), Ron Masek (from the TV show MURDER, SHE WROTE), Claude Aikins (from the TV show MOVING ON) and our director, Bobby Williams. It was called TOM KITE AND FRIENDS. 2)	Crew picture when we wrapped an episode of LEXX, a Canadian sci-fi TV series. I’m top right and my son Cody is 3rd in. He doubled the lead actor. 3)	News conference in Fornelli, Italy when we were preparing to shoot a war picture. I’m 2nd from left but hard to make out. 4)	Working on a Roy Rogers Special in Alamo Village, Brackettville, TX. Here I’m with Bob Nolan who was with the singing group SONS OF THE PIONEERS. A local guy is on the right. 5)	Here I’m with Rudy (a wrangler), Quinn “Big Boy” Williams (actor), the local guy and Roy Rogers. so interesting thank you for sharing! !